Michael's Deli in King of Prussia, PA. Part diner, part beer garden, part Jewish Deli. To the left is "Michael's Platter". I regret I didn't have the captive husband rotate the plate to show the mounds of meat in the front, but it's piled with pastrami, corned beef, cooked salami, cheese, coleslaw AND potato salad, and sandwich toppings. It's served with a mound of whatever bread you like to build your own sandwiches. And it's only $10. It's the only place within a 15 mile radius that I can get hand sliced lox to order when the craving strikes. They serve breakfast all day, and have over 100 types of bottle beer for sale. Great pickles, authentic knish, and tomato pie by the slice. Don't forget Jewish Apple cake. When my mother in law is on baking strike, I eat theirs. I don't regret to report that the waiter slash magician I wrote about here is no longer employed there. Brooklyn (Jewish) Empress Deli (gasp) no real website. Crunchy beef hot dogs and crispy Coney Island Knishes. Triple decker sandwiches and chocolate egg creams. Brooklyn (Italian) Star Cheese Salumeria - 20th Ave. Googling shows it may have closed. I didn't appreciate hand made mozzarella and the best mortadella when I was 6 years old. An Asian family bought it and kept it Italian, making mozzarella everyday and even wearing the old Italian lady housecoats as uniforms. This is where my semolina knot roll came from for my elementary school sandwiches. Washington D.C. (Arlington, Italian) The Italian Store This place reminds me of Brooklyn, and South Philly. They also have a nice selction of wines. Waiting for made to order sanwiches and pizza is controlled chaos, and worth the wait. I remember the Empress Deli and of course, Star Cheese. I really miss Brooklyn food reading this entry! I miss Brooklyn too! Next week I'm making egg creams at home. Lucky you!! The nearest deli to me is probably in Toronto or Ann Arbor( Zingerman's). 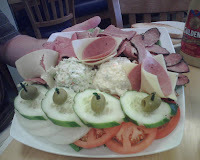 I still miss the NY style deli's I grew up with. Zingerman's is on my list of places to make a food pilgrimage too. They are pioneers in the business. I worked around the corner from the Carnegie Deli in NYC. It was good, but not great. Thanks for visiting!